Tee off your next great marketing campaign with our promotional golf ball tubes! 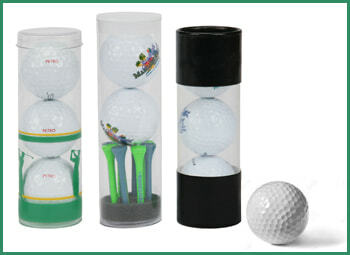 Promotional companies count on Petro Packaging as their reliable supplier of custom plastic tubes for golf balls. We provide 1 ¾” diameter clear thin-wall sealed bottom tubes in all custom lengths tailored to fit the featured products inside. Gift pack ideas include not only golf balls, but also tees, ball markers, and divot tools. Attractive gift packages that make great prizes! Perfect for golf outings, sporting events, conventions and trade shows! Crystal Clear to showcase personalized and specialty golf balls!